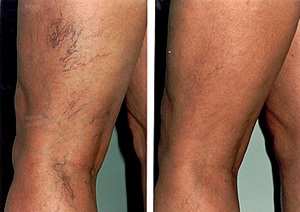 Thread veins on the legs are very common affecting over 60% of the female population. They vary in size from the very red lines that can only be seen clearly using a magnifying lamp through to dark purple networks of veins, difficult to conceal even with the highest denier stocking. 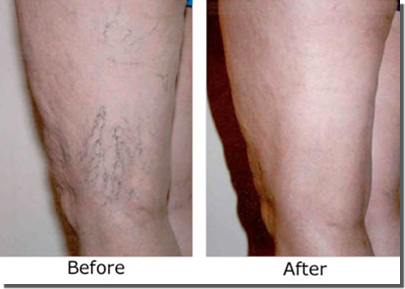 Sclerotherapy has become established as the definitive treatment for medium to large sized veins on the legs, as it is extremely effective. Sclerotherapy is a fine injection technique, which involves the introduction of a small quantity of sclerocing agent into the veins itself. The tip of a very fine needle is introduced just under the skin and the agent injected into the vein producing what is called the flush. The sclerosing agent irritates the lining of the vein damaging the vessel wall. You may experience a pricking sensation as the procedure is being performed but it is very rare for any to experience pain. For 24-48 hours the area around the vein may be red and raised rather like a nettle rash. This quickly fades to leave a vein which darkens and becomes initially more obvious. Darkening and blackening of the vein can last for two to three weeks and will obviously depend on the calibre of the vessel being injected-larger veins tend to be darker and blacker than the finer ones. Therefore the veins gradually start to disappear, with the whole process taking six to eight weeks.